What's the best thing about your family? Families are great, aren’t they? They support you, care for you, annoy you and love you unconditionally. Every family is special and, let me guess, your family is the best, right? Well now’s your chance to tell them – and the world! – what the best thing about them is and you could be rewarded with a Center Parcs break. It’s really simple. Just send us a short video telling what your favourite thing is about your family and why. Don’t worry, you don’t need Spielberg-standard recording equipment, most smartphone cameras will do the trick. You have until Sunday, 3 April to submit your video. We’ll then select our favourites and put them forward for public vote. The winning entrant will bag themselves a fantastic Center Parcs break for themselves and their family. Need some inspiration? Check out the video on the left. So set up your camera or smartphone and shout it from the rooftops – why is your family so great? 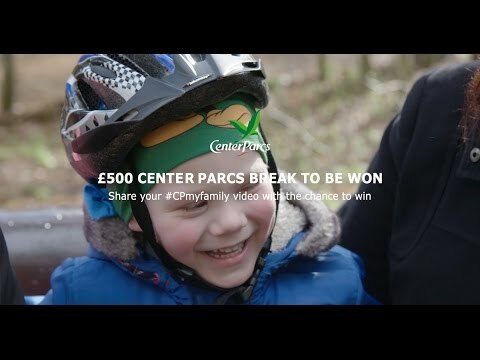 Send your video entry to our Facebook or Twitter page using #CPMyFamily or email us on competitions@centerparcs.co.uk Terms and conditions apply, see them here. The thing I Love about my Family is that they are all grown up and independent but when we get together we all have so much fun.. Just enjoying being together with our two dogs, A White miniature Schnauzer and a White Miniature Poodle, their ages differ considerably but they are great friends just like the Three Girls and one Boy my Wife and Myself A TEAM of Six making our own shared Pleasure Together! What I love about my family is that despite the fact that we bicker all the time, we all love each other with all our hearts and would do anything for each other. What I love about my family is, at the age of 41 I have the perfect 2 year old son I could ever wish for after thinking I wouldn’t have children. My partner is the perfect soul mate & Daddy to my son. What more can I ask for…. My family, what can I say… I love the fact that I always have some to think and care for, and even if I get crossed with them, they always love me and are there for me as I am for them. I love that my nearly seven years old always tells me that he loves me and that he sees me as his big fat soft teddy bear (not something I would love coming from anyone else! :-)) I love that my husband has been very supportive over the years and has always helped me with anything I decide to do, he is the perfect daddy to our little boy. I love my family because they are everything to me and I couldn’t wish for a better family. As Brand Content Manager I plan, create and curate the best articles, photos, videos and music for our channels, in particular the blog. With a degree in Journalism under my belt and many years’ experience in the big smoke as a journalist and editor, my focus is firmly on discovering the little gems hidden away in Center Parcs life, before buffing them up to make them sparkle online. From on-village events to the latest travel industry trends, I’ll be there – notepad in hand – to bring you the most entertaining and interesting stories.